This pinwheels are great treat for people who love puff, pizza and samosa. It is a combination of all 3. I prepared this pinwheels for many times at home but really don't remember when I bookmarked this recipe from which site. The stuffing used in this recipe can be changed or altered as per personal preference. I used carrot and boiled, mashed potato for stuffing. I have also tried it with other vegetables but I found preparation of the below stuffing was easy. If you use vegetable stuffing, you need to roll puff sheet tightly than the normal rolling. Otherwise vegetables get jammed at the end or move towards the unrolled space. 1) Thaw the puff pastry sheet as per the directions mentioned in the pack. 2) Preheat the oven to 400F(220C) or as said in the pack of puff pastry. 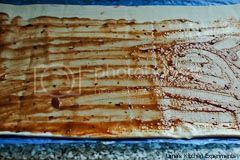 Line the baking tray with parchment paper. 3) Meanwhile, in a mixing bowl, take all the ingredients given for stuffing except cheese. Keep it aside. 4) Spread the puff pastry in the kitchen surface. 5) Apply pizza sauce over it. Leave an inch space at one end of the sheet. 6) Now, spread the mixture from the mixing bowl on the puff pastry. 7) Sprinkle cheese on top of it. Add more cheese if required. 8) Roll the puff pastry sheet from one end to other end. Refer the picture. Roll firmly. 9) At the end of rolling, apply little water where we left the space (as said in step 5) and seal it properly. 10) Now, cut the rolled puff pastry into 1 inch pieces. 11) Place them in baking tray with even intervals. Make sure to leave sufficient space between pinwheel since they enlarge while baking. 12) Bake for 15-20 minutes or as said in the puff pastry pack or the puff pinwheel get golden brown in colour. 13) Cool for few minutes and very gently brush with little oil. 14) Enjoy with hot tea. 1) Stuffing can be changed as per personal preference. 2) You can also skip the Indian masala and add pepper, Italian seasoning for exact pizza taste. 3) Try to serve warm for best results. Lovely presentation, they have come out perfect! awesome recipe. looks so so so good. Incredible pinwheels, feel like grabbing and having some..
Btw for q'n about fish fry, yea you can use any kind of fish for it. looks fabulous and yummy pinwheels..
Good one...would love to try it sometime. What a fabulous idea!!!! Marvelous recipe!! !Looks delish!! An interesting twist or twirl, in this case. Looks awesome! Looks so awesome. I love the masala combo in the puff pastry. Very addictive snack, not only for kids...and pizza sauce gives additional touch.. Awesome click too..